The new high-rise under construction on January 26, 2019. A new 27-story high-rise at the corner of East 53rd Street and South Cornell Avenue will be ready for pre-leasing in March, with move-ins beginning in September, a spokesperson for developer Mac Properties told The Maroon. The project sparked controversy when it was first announced, as some worry it may drive out lower-income residents and cause parking problems. The tower will replace a former parking lot at 53rd and Cornell. It will also extend the 53rd retail corridor further east. Proximity to the 53rd Street shops, the University campus, the UChicago Medical Center, the lakefront parks, and the 51st/53rd St. Metra station will provide residents with convenient access to the surrounding area and downtown Chicago. The building will have 246 apartments of varying sizes and configurations with parking spaces in the lower floors. Peter Cassel, director of community development at Mac Properties, described the building’s design. “While 5252 is unabashedly modern, the rich history of East Hyde Park architecture inspired the color palette, contoured geometry, and facade details. The traditional stonework podium is proportioned to a residential scale, while the high-rise above presents a modern interpretation of a staggered bond brick pattern,” he said. According to Cassel, tenants will have access to a rooftop terrace, lounge, outdoor swimming pool, fitness center, and sundeck. 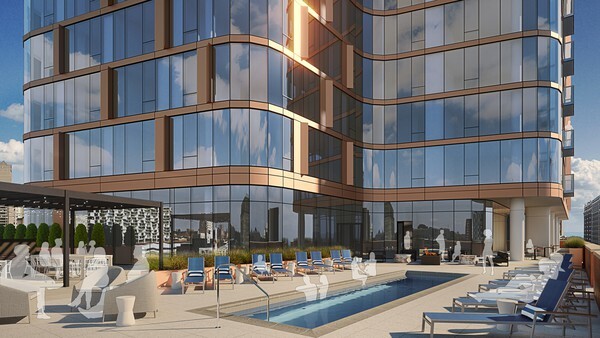 A rendering of the pool area at 5252 S. Cornell Avenue, which expects to open for move-ins beginning in September 2019. Some community members have mentioned noise disruption from the construction site. “They work Saturdays, even some Sundays, often starting as early as 6:30 a.m.—with absolutely no regard for neighbors who have to put up with all the noise,” said Dhilanthi Fernando, who lives in the high-rise just north of the forthcoming apartment building. “The folks who live in the townhouses adjacent to the building are affected even more. Furthermore, during the first weekend of this year (January 4–6), they closed down the entire block to traffic, making it quite difficult for driving on Cornell Avenue. Hopefully, the jackhammering and other noises are now over, or will be less, and the next stage won’t be quite as loud,” she added. The Hyde Park community has had an influx of rental apartment complexes within the last several years. Mac Properties recently unveiled two new apartment complexes on the South Side of Chicago. 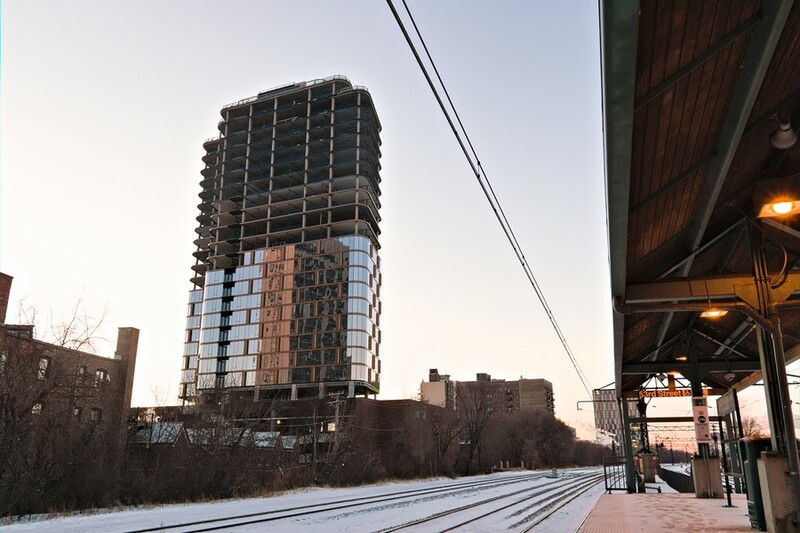 The 180-unit City Hyde Park, a mixed-use apartment tower near Lake Michigan and the 51st/53rd Metra station, opened in 2016. Solstice on the Park, at 1616 East 56th Street, opened in the spring of 2018. The 26-story tower overlooks Jackson Park, site of the forthcoming Obama Center. According to the website of the apartments’ designer Studio Gang (who also designed Campus North Residential Commons), the building is engineered to maximize sunlight exposure for solar warming during the winter. Vue53, a 13-story apartment complex on 53rd Street with 267 studio to two-bedroom units for rent, opened in late 2017 as a collaboration between Peak Campus and the University. Vue53 is marketed towards University students as an off-campus living option close to the University campus. This article is part of the Maroon's 2019 Housing Issue, appearing in print on January 30.